I love me some fall! Fall is one of my favorite seasons. Cozy sweaters, warm soups, cute boots, and jeans are brought out of retirement after a long, hot summer, and the weather is perfect for running. And, of course, there’s the return of hot tea! I thought I’d dedicate my first post to the most awesome thing I’ve bought in awhile: the Aladdin Tea Infuser Mug! Seeing as I have a total addiction to Starbucks, when I saw this little gem at Target the other day I thought I might have finally found the solutions to throwing away hundreds of dollars a month. Before, my excuse was always, “I want tea… but I’m about to run out the door.” Or, “Even if I bring this mug of tea with me, I’ll have nowhere to put the tea bag and then it will get bitter and gross.” etc, etc. Enter my new mug! If only I were smart enough to invent something like this. ;) I don’t have a kettle, but the mug is microwave safe (and BPA free! ), so I can heat my water right in the mug! Then, when you are ready to add your tea, it has a built in retractable mesh tea holder, which you can put loose leaf or bagged tea into. Once you’ve filled the mesh holder up with tea, put the lid on and extend the tea down into the hot water using a lever on the side of the mug, let it brew for a few minutes, and then retract it back up into the lid when you’re done brewing! No bitterness, no mess. What will they think of next??! My favorite kind of tea is Earl Grey, with a splash of milk. Mmmm… tastes like Europe :) What’s your favorite kind of tea? Have a lovely day, friends! I’m off to try a short run. I’ve been training all summer for the Army Ten Miler, which is on Sunday, and of course about two weeks ago my right knee started hating me. I ran in a 10k last weekend, and it’s been really sore and angry this whole week. I’m praying it will be okay for the race on Sunday after all my hard work – this will be my first 10 miler ever! Next article: Carbo loading at itâ€™s finest! 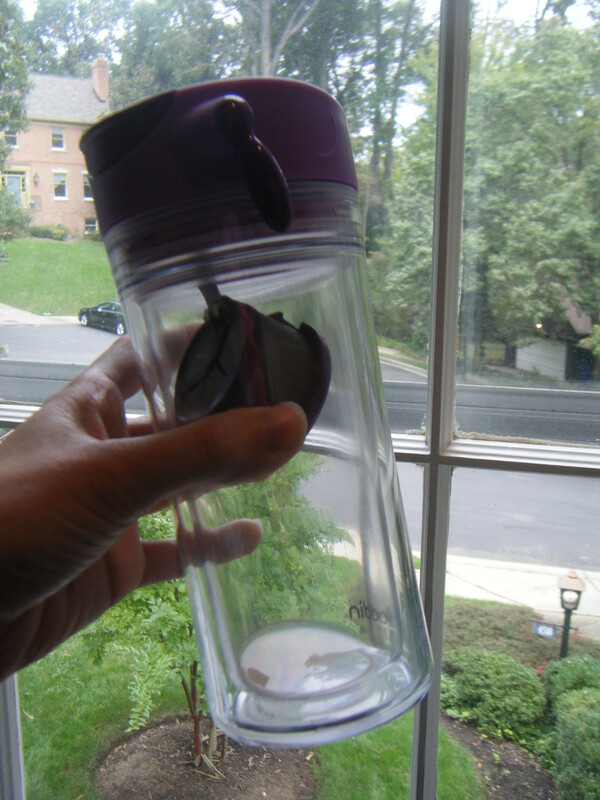 I really want one of those tea infusor to-go cups. People have them at yoga all the time! Welcome to blog world! I really want one of the tea infuser cups… My favourite tea is Assam, but English Breakfast is a close second. Today’s weather definitely warrants curling up with a big mug of tea! Great blog! :-) Oh how I wish I liked tea… I just think it tastes like grass!! Any suggestions for flavors that aren’t grassy? Good luck on Sunday, I’ll say a prayer for your knee! Anne! First of all… Do all of your blogs involve horrible puns? I hope so. That tea thing looks awesome. My favorite tea? Darjeeling. ANNE! this is holly – you probably don’t remember but i had emailed you about teaching abroad in europe awhile ago…YAY for your new blog! i can’t wait to read more. i didn’t make it to teach english, but i am employed now so i will take that for the time being! YAY! Glad you see you started a blog! It was great meeting you at the Summit. I will be reading! Awesome. I was just thinking to myself yesterday, that while I’m a recent tea convert, I needed something more efficient to take with me when I go into the office or class. And lo and behold, your first post gives me the answer! Thanks! My fav kind of tea is Jap. green sencha. Its the only thing I drink now! Hey – I loved your Prague blog, looking forward to reading more! Can’t wait to read future posts! Hello. I also love tea and coffee. Just got back from China and they make some amazing tea kinds there. If you have a chance, you must definitely think about visiting.